Basket swap, and we're blogging about it today. some of these pics, but I'm showing them again. from the very talented Cathy. Everything was wrapped so pretty. with the cute chick and little nest. This is the basket I sent her. I saw her beautiful wrapping! 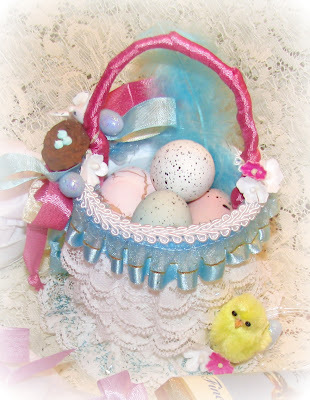 sparkly basket filled with glittered eggs. And this is the basket I sent to her. Thanks again Cathy and Jen! I love my baskets and goodies. this sweet and fun swap. Check out more sweet baskets at Rhea's blog. Debi darling popped in to wish you and your family a joyous and blessed Easter. Hugs to you and thanks for this amazing post. Such creations would make anyday so joyous! Blessings. You received some beautiful pretties in your swap. I did too, check mine out. Really loved all the different baskets and how differently they were decorated. have a sweet & happy easter! Everything looks beautiful! I especially love the mercury glass handle! What a great idea that was! Thank you for all your love and prayers for my husband and myself. So much caring from so many wonderful friends have made this journey a little more bearable. 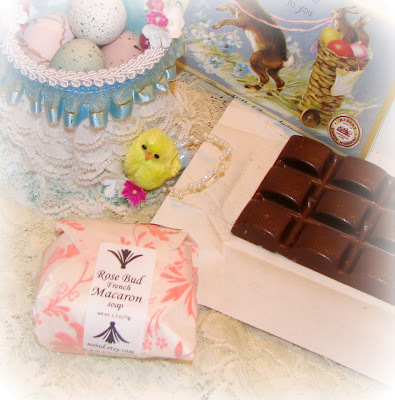 Such pretty Easter goodies!! Happy Easter to you and yours!! Love all the goodies you got in the swap. You been lucky!!! I just wanted to come by and wish my sweet friend, (you) and your family a very Happy Easter. debi, your world is so so so so so so pretty!